In more recent years monitors, otherwise VDUs (Visual Display Units), have become wider and curved. Curved VDUs are the latest display innovation pioneered by Samsung and LG. Now many of the best gaming VDUs have curved displays. 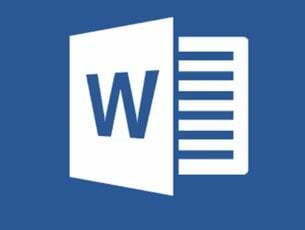 But what’s so great about the curved angle? Some might say it is a mere gimmick than a genuine VDU enhancement. However, there can be little doubt that the curve display generates a greater sense of immersion and wider field of view. These are some of the best curved gaming monitors for Windows games. The ASUS ROG Swift PG348Q is a curved VDU with a stunning display that’s retailing at $1,603.93. It has an immersive ultra-wide screen that expands 34 inches which is ideal for panoramic gaming. The PG348Q’s IPS panel provides a dazzling array of colors and visual quality that’s hard to beat. This isn’t a 4K VDU, but with a native resolution of 3440 x 1440 it’s not far off. The monitor incorporates Nvidia G-sync technology that optimizes it for gaming by removing tearing and minimizing input lag. The PG348Q’s Turbo Key switches between a 60 Hz and 100 Hz refresh rates for slower or faster paced gaming. Another great thing about this VDU is that it includes six alternative display modes on its OSD (On Screen Display) settings menu so that you can optimize it for alternative content. You can select an FPS, RPG, sRGB, Cinema, Racing and Scenery display mode. For example, selecting Racing minimizes input lag for racing games and FPS applies higher contrast settings for first-person shooters. The Acer XR341CK is a great gaming VDU that’s ideal for AMD desktops. 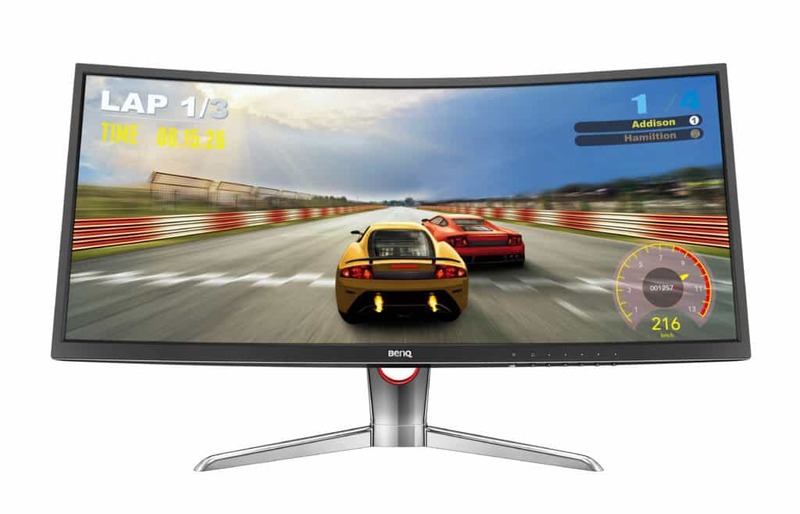 This monitor has a curved display with a curvature radius amounting to 3,800R. Its AMD FreeSync tech eliminates screen tearing for a more fluid and smooth picture. 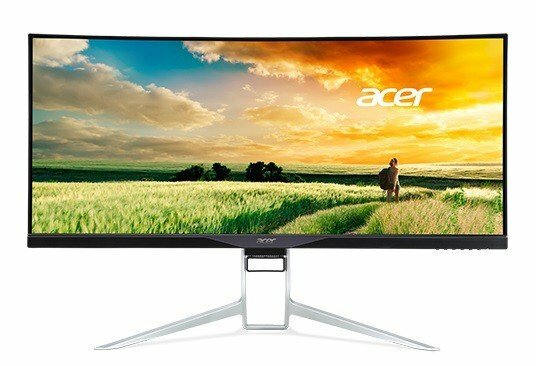 The Acer XR341CK has fairly similar display specifications to the Rog SWIFT PG348Q as the VDU also has 34-inch panel with a crisp 3,440 x 1,440 resolution. It has a default 75 Hz refresh rate that can be configured to 100 Hz. Aside from its display specs, the Acer XR341CK has great audio quality for games. 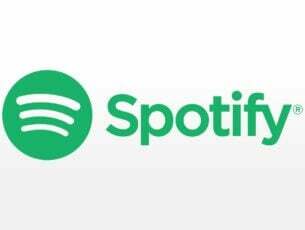 It incorporates a couple of 7W DTS sound speakers for heart-pumping audio. This VDU has numerous I/O ports with five USB 3.0 and two HDMI 2.0 ports (one of which enables you to charge tablets and phones). This monitor also enables users to connect a couple of devices and display their contents side-by-side. 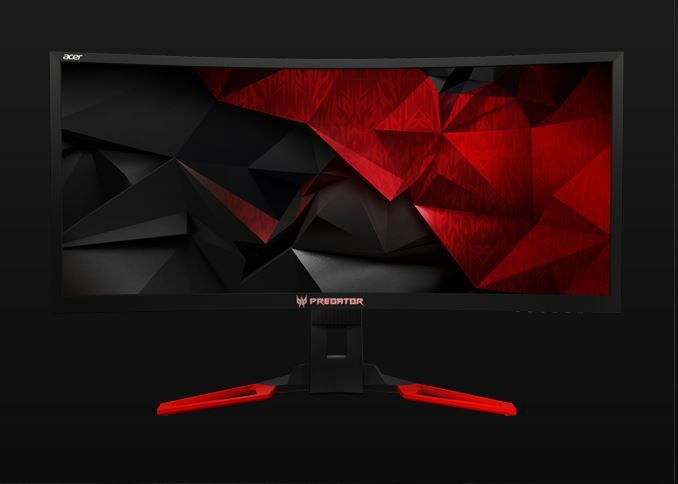 The Acer Predator X34 is a VDU designed specifically for gaming. This is a 34-inch VDU that incorporates Nvidia’s G-Sync to eliminate tearing by synching graphics card and monitor. Its IPS panel provides rich colors without impacting game speed, and the X34’s 3,400 x 1440 resolution enhances graphical detail. The X34 also boasts a 100% sRGB color gamut for the highest color accuracy. Its refresh rate is a default 75 Hz that you can clock up to 100 Hz. 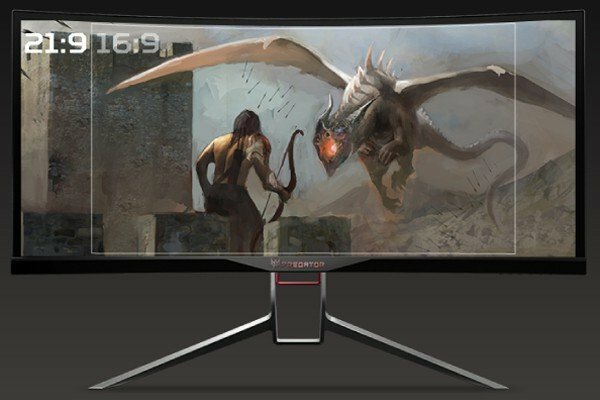 Acer Predator X34 has a novel GameView that gives players extra options. With that you can adjust color and dark boost levels. It enables you to set up aim points in first-person shooter games. You can also save custom settings in three alternative profiles and switch between them when required. The BenQ XR3501 is another of the best gaming VDUs that has a whopping 35-inch panel display. The curved display also has a more marked 2,000R curvature radius. 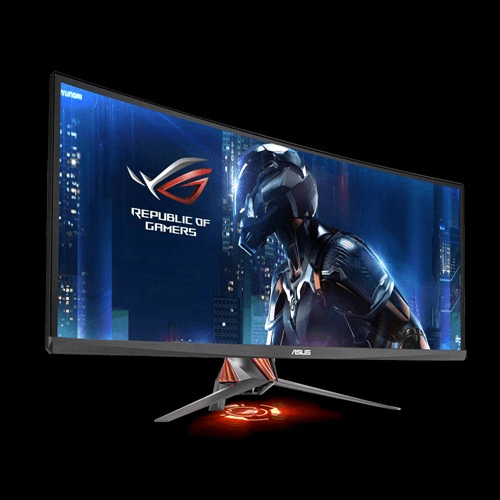 However, what really sets this monitor apart from some of the others is its 144 Hz refresh rate specification that ensures the smoothest gameplay. The XR3501’s 2,560 x 1,080 resolution isn’t the best, but still pretty good. The BenQ XR3501 also has a variety of extra options. It includes nine Picture Presets to configure display settings for more specific games such as racing, first-person shooter, etc. You can select 20 color vibrance settings and enhance the shadow detail by activating the VDU’s Black eQualizer. In addition, users can select Picture-in-Picture and Picture-by-Picture options to display two alternative devices simultaneously. The Z35 is another in the Acer Predator series of gaming VDUs with a curved display. So it’s fairly similar to the X34 in terms of design and specifications. One notable difference is the Z35’s lightning-quick 200 Hz refresh rate compared with the X34’s 100 Hz. So higher paced games will certainly run very smoothly without any choppiness or tearing. The Z35’s Nvidia G-sync further eliminates tearing. The Z35 also has an expansive 35-inch display with a curvature radius of 2,000R, but the monitor’s resolution is a slightly more limited 2,560 × 1,080. The Z35 also has much the same configuration options as the X34. For instance, it includes the same GameView with which you can set up aim points and configure color and boost levels. The Z35 also has the same customizable LED lights that can be configured to green, white, orange and other colors. In addition, users can also select three overclock settings for 160, 180 and 200 Hz refresh rates. Those are some of the hottest curved gaming monitors of 2016. These are gaming VDUs that have great picture quality, killer designs, cinematic aspect ratios, high refresh rates and handy configuration options.